The Challenge: Do something that is typically seen as inappropriate for someone of your age. One thing that I loved about childhood that I wish would be appropriate in adulthood is the act of building blanket forts. Having older sisters I was introduced to this activity pretty early on. Then, all of a sudden you get a little too big to be under there. I remember when I would baby-sit in junior high and high school I often suggested the ‘blanket fort’ as an option for something to pass the time. The kids loved it, as all kids do. Having a workspace at home gave me a huge advantage with this one. No cube neighbors would give me strange looks. I grabbed some tacks, rubber bands, and an old sheet (a blanket would’ve been too heavy to rig up as tall as I needed it to be). My actual workspace is pretty small and it pretty much fit under my propped-up sheet, a.k.a. 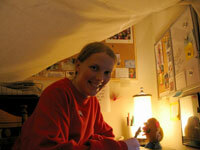 ‘cool fort.’ It did invoke a childlike excitement sitting under there, typing away and making calls. If only the person on the other end could see me — oh my, this WAS inappropriate for someone my age. When I was a kid, we hardly ever got McDonald’s Happy Meals. With three boys, it was always cheaper for my parents to buy us each a cheeseburger and have us split a large fry. But oh, how I pined for those Happy Meals. The colorful little boxes, printed with messages of untold joy, hinting at the wonderful toy hidden inside. (Sadly, the boxes have been replaced by less than exhilarating paper bags — kids of today don’t even know what they’re missing!) I can probably count on one hand how many Happy Meals I have had in my lifetime, and I’m guessing it has been over 20 years since my last one. I thought about the irony: when I was a kid, I wanted Happy Meals but couldn’t do anything about it; now that I’m a “grown-up,” I could get a Happy Meal anytime I want but might be considered a freak job ordering one without the cover of a small child nearby. Well that fear of being labeled a social outcast ended today, my friends, as I proudly stepped to the counter to order my cheeseburger Happy Meal. And what a Happy Meal it was. Oh my goodness. As I was reading about what you both decided to do to “Do something that is typically seen as inappropriate for someone of your age.” I couldn’t help but laugh. Because I still do both of those things. About a year or two agao, I was spending the night at my best friend’s house, who is just as much of a “big kid” as I am. We were playing some Super Mario Brothers (the original, on the original Nintendo) when we decided to make a fort in her brother’s old room where we were playing the game and sleeping that night. We took out the old sheets and we set them up around the ceiling fan, (it was off when we had it up) and then tacked the edges of the sheets to the walls. It was pretty dang cool. The way that the sheets fell, it looked like an arabian tent more than a fort and it felt like we were arabian princesses on a caravan. For awhile we even pretended that we were.It was so awesome! Every once in awhile, when the fast food place I am at has a toy that is just so totally cool that I cannot resist it, I get a kid’s meal and cannot wait to see which toy I get. Sometimes it is cheaper than what I would have spent, which is awesome because I get to save money AND get a toy! But when I order these kid’s meals, I get weird looks from the people taking my order and I am never ashamed that I am ordering one without a kid around. Plus, I am not afraid of being outwardly excited about the toy… I don’t care who sees, I am just tooo excited. Haha. I love both of your ideas for this challenge. I dressed up as a superhero. Oh, and I did a bit of skipping. Still sick here so not doing much moving around. The flu stinks and I’m gonna call in to work. On a related note…I have no idea who to vote for. Well, our first idea was taken by Jason and we want to be unique so we thought of something else. We had a full fledged wrestling match. We cleared all the furniture out of our living room, stood in opposite corners, and wreslted. No biting, no tickling, no pinching, no ball grabs, and no hair pulling. We set a ten minute time limit in which you could win by pinfall or submission. Katie was winning for a while, but Doug came back strong and got Katie to submit with the full Nelson 8 minutes into the match. Katie was defeated, and a good time was had by all. We enjoyed a bout which is enjoyed mostly by ten year old boys and completely inappropriate for twenty somethings. I guess I must really be into this childhood stuff because last night I had a dream. I am the operations mgr of Maze Lumber in Peru, Il. and I had a dream that I was driving our “special” fork lift. The thing actually flies and here I was high up in the air on the fork lift looking down on the yard and admiring how neat and tidy it was when I realized how I was over the Illinois river that runs along our lumberyard and I became afraid that I might run out of gas and me and the fork would land in the river. How would I explain that to my boss? And just then I looked to my right and I saw my boss and a bunch of businessmen looking up at me wondering what’s up with the flying forklift . Then I woke up. Tonite my wife Linda and I went to a very nice restaurant in our town called John’s North Star. I complimented our waitress Connie about her very nice snowman pin and said,”I would like a kiddie cocktail in your fancyist glass please. When I got home I did 3 Bugs Bunny dot to dot and topped that off with coloring a picture in my Bullwinkle coloring book. I broke the brown and had a hard time staying in the lines and was troubled by the color scheme. Today – I skipped and sang out loud ‘Skip to my Lou, my Darlin’ outside in front of a very large department store – the IKEA in the north suburbs of Chicago. Then I proceed to skip (slowly albiet) through the revolving glass doors with 2 people in the same compartment as me. It was kinda fun! Today I was able to have big fun – I jumped on the bed! Completely inappropriate for my age, but I highly recommend it to anyone who has a bed strong enough to support such an activity (in fact I recommend a hotel room with two beds for jumping back and forth). I found myself laughing so hard I was breathless. I need more occasions to laugh that hard and I’m gonna work hard to find more reasons and more times to laugh. I did this in Memphis, TN where I went for a weekend wedding. I couldn’t really thinking of anything – until I got to the swanky rehearsal dinner. Just before eating my fabulous steak, I unfolded my white linen napkin and tucked it into my shirt so I had a gigantic bib on. I wasn’t sure if it fit the criteria for today’s challenge, but it got a lot of laughs around the table and I got to tell them all about the Escape Plan. Someone even snapped a picture. By the way, I highly recommend Jim’s Place if you’re in Memphis any time soon. I did this with two of the participants of the training I conducted. It was a Sunday so we had our training break. Leo and Fe said that both of them is suffering from info overload because of the training, while I was stressed out because of my work. We went to a children’s amusement park where we took bump cars. We didn’t care that most of the drivers in the bump car were kids. We bumped them as hard anyway. Felt like we had our brains shaken. Then we shoot hoops. We left the place laughing our hearts out. Yesterday, it didn’t snow a predicted, so that afforded me more time for the play parts of the party. It was a great day, lots of fun. Nanook of the North was amazing. You can see an excerpt on my blog. What a life changing experience to, so intimately, witness their lives of joy amid such harsh conditions. For today’s challenge I’m going to skip everywhere. My original thought was a long time dream I’ve had to buy me some shoes with Wheelies in the soles. I’ll love to go Wheelying around in Walmart. I mentioned it to my daughter a few weeks ago. She’s 18. She was mortified just thinking about it, with just makes me want to do it all the more. Trouble is I can’t find a source for Wheelies in my size. Last summer I noticed a tough old Highway Patrol Man who had just retired, irrigating a pasture on a piece of property he’d just acquired. He had a shovel over one shoulder and was skipping down the ditch bank. I decided for today that if ornery old Radar Dave could do it, so can I. Well, it seems I am a little late to discovering this blog challenge. But, nevertheless, I think I was able to meet the challenge. I made a point of going out to play with the dogs (always fun!) and crafted a very handsome snowman in the process. Sadly, I noticed it had been demolished shortly after I got back in the house. While there were no witnesses I have my suspicions that our exhubrant Boxer – Cassius- may have had something to do with it! Luckily, I had a brand new pail of chalk handy for this challenge! And I finally got a reason to put it to use. Yes, the only time I ever see sidewalk chalk creations around my college campus is when someone is trying to express a political opinion or advertise an event on the sidewalk. I guess that’s the “appropriate” way to use chalk as an adult. Why not silly drawings? I feel like if there were more chalk drawings around, it would make people happier. So I did just that around my apartments! I didn’t have a lot of time, but I made a smiling sun with “Have a Happy Day!” written under it at the nearby bus stop people around have to wait at (can’t wait to see it tomorrow morning when I have to get up early to work on campus!). Then I went to the apartment mailboxes and drew hearts and peace signs on the sidewalk on one side of them, and a hopscotch game on the other! I was drawing it upside down to avoid getting chalk on my jeans and drew some of the numbers in the squares backward! Whoops! Hope people don’t mind. If I see someone playing hopscotch while out to check their mail, that’ll make my day! I’m the director of a small day care center, so I decided to take advantage of my resources. I took a pirate Mr. Potato Head from one of the rooms & played with it during my lunch break! I don’t always act my age, so this one wasn’t too difficult. I don’t worry too much about what people think of me, and I’ve been known to do crazy (but not too over-the-top) things in public. I put a couple of small toys in my purse (an egg of silly putty, a matchbox car, and a purple wiggle worm which is a kind of magic trick where the fuzzy worm is tied to a clear string and you’re supposed to make it do tricks.) My boyfriend & I went to Friendly’s (an east coast family diner/restaurant) last night, and he played with the silly putty while I played with the matchbox car. No one really noticed what we were doing, and even if they did, I doubt they would care much. It’s the joy of going to Friendly’s! 🙂 Later that night, we went to see a show with a couple of friends. I pulled out my wiggle worm, and I tried to show it off. Our friends seemed to enjoy watching my boyfriend teach me how to work the darn thing. I had to give Kim the vote here, just because I know so many adults who order Happy Meals in order to save a few bucks. But Jason’s right about the boxes, that’s really what the meal was all about. I remember once my happy meal box turned into a castle. Totally sweet! I had fun doing age-inappropriate things today, and realized I ought to do them more often! On Saturday I took part in a mass outdoor hula-hooping workshop at the Sydney Children’s Festival. Made me feel like a big kid. Two other adults did join in but I was very much outnumbered by children!